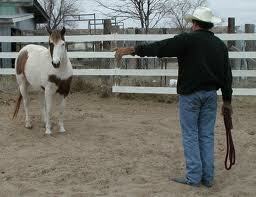 Natural horsemanship has changed the way horse trainers approach a horse for the better, and for ever. “Horse Breaking” is a practice only applied by those who are sixty years behind the times. However, even this wonderful approach can be misinterpreted by inexperienced newcomers, such as I have recently discovered. In my life I’ve made contact with a section of the horse industry with whom I had not been acquainted previously, and I realized that these people need some coaching in the “opposite” direction. I am a staunch supporter of natural horsemanship, and kind and non-abusive training techniques. I’ve written a manual on training techniques which beginners and novices apply successfully, and even top trainers are applying many of the techniques described in it. This whole e-book is based on mutual trust, confidence and discipline, the natural horsemanship way. But I’ve also discovered that horsemanship hasn’t only got one extreme – abuse, force, cruelty – but also another opposite extreme: timidity. This is found mostly among inexperienced newcomers to this beautiful industry. Let me hasten to say that this is by far preferable to cruel, abusive techniques, but it is still far from optimal horsemanship. To get this in perspective one should use the horse’s nature as a starting point. Bear in mind that horses are herd animals , and in the herd there is a hierarchy. While the stallion protects the herd, a mare is the matriarch or leader. In their natural state there is a leader and subordinates. That is just the way it is with horses. In a one on one situation a horse will always test the other party – equine or human – to see who is the leader – the person or other horse, or itself. Of course the degree of testing differs between individuals, like it does in humans. Take a class of school children as an example. A certain group will willingly submit to the authority of the teacher, while another group will always challenge the authority of the teacher. If the teacher has a strong personality, he assumes control and authority, the rebel (challenger) knows where he stands, there is order, stability and progress. If the teacher is timid, there is confusion, instability and turmoil. This doesn’t mean that the teacher is cruel or abusive. He is just strong, firm and in control. AND HE GENERATES CONFIDENCE. Likewise a horse looks for a leader. Although I strongly reject abusive training techniques, I think it is equally important to warn novices about the danger and consequences of treating a horse like a baby. Let me ask you: did you and the rest of the class perform your best in the class of Miss Meekandmild, or in the class of Mr. Fairbutorderly, where there was authority and order? Assume authority right from the start. Let the horse understand right from the start which one of you is the leader. If the horse finds out that it can overrule you, it is a matter of (a very short) time before it will have no respect for you, and eventually you will not be able to do anything with it, and it will end up in the slaughter house. Of course there are degrees to which horses will challenge you – some horses are more submissive by nature than others. But if you can only get along with 30 to 50 percent of the horses you meet in your life, I don’t think you can call yourself much of a horseman/horsewoman, do you? It frustrates the living daylight out of me if I see people baby-talking a horse. Beware – that horse is going to challenge you, and you are going to come second. Horses are strong animals, and by natural selection they have been bred and adapted to survive in a hostile environment. If they couldn’t defend and protect themselves, they would have become extinct. My two daughters are two beautiful, feminine, refined women, yet they run marathons of sometimes over 20 km. (13 miles), keeping the pace for long periods of the time. They haven’t died of it. All that happens is that they are healthy, fit and feel good. But I have met a few people who don’t want a horse to work once the horse starts perspiring. Comments like: “He’s getting tired now; we’d better stop” when the horse had barely started to sweat, spin my head. Every athlete is being pushed to the limit, and a horse is much more hardy than a human. If it had to stop after 5 minutes of running in nature, there would be no horses left today; the predators would have eaten them all. PLEASE. Don’t conclude that I am encouraging abuse. I use the most non-abusive techniques I am aware of, and that is what I teach throughout me entire book. I think natural horsemen such as Monty Roberts, Pat Perelli, John Lyons and Larry Trocha did mankind (and the horse world) an incalculable service. I’ve learned a lot from them, and I apply their approach and it forms the foundation of my techniques. I am by no means contradicting what they (and myself) advocate, and I stand in awe of their knowledge. I just feel that it is my duty to warn beginners against the impending danger and unpleasant consequences of treating a horse like a baby. Be kind, but firm, sensible and realistic. The one extreme is as far from the ideal as the other. Be kind, but firm, and take control. Demand respect. Demand discipline. Be the leader from day 1. One last thing: if you talk to a horse, don’t squeak like a mouse; talk like someone who is in command. Horses have no respect for mice, but they respect authority. That is just the way horses are.